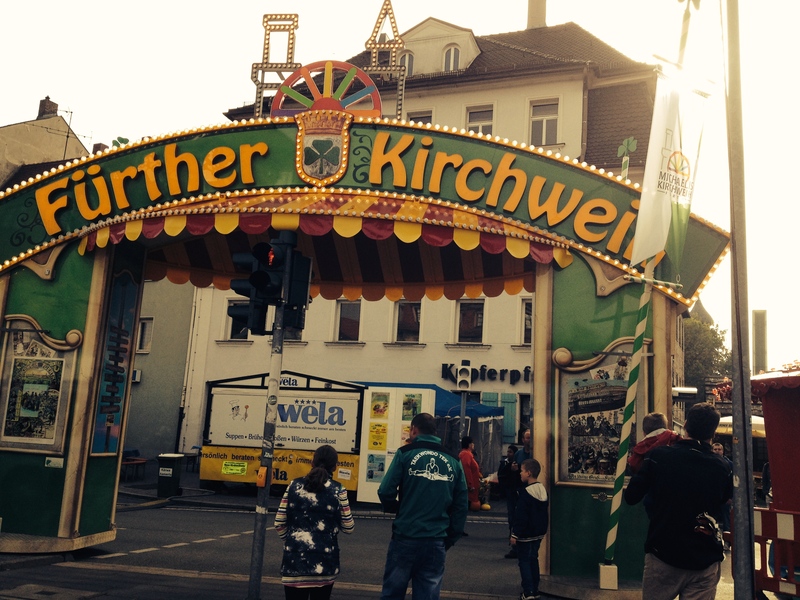 The entrance to the Kirchweih–where delights for all the senses await you. 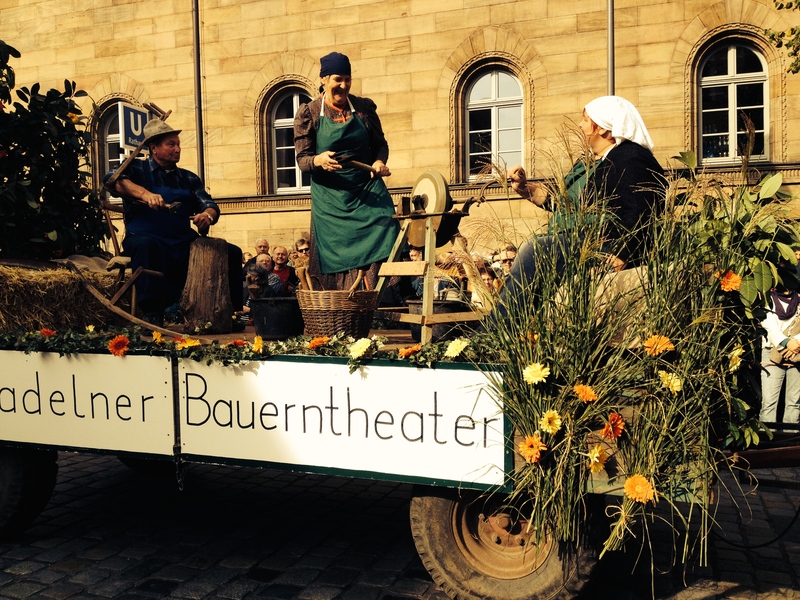 Only a 15 minute drive from Herzogenaurach, we decided to check out the fest in Furth. 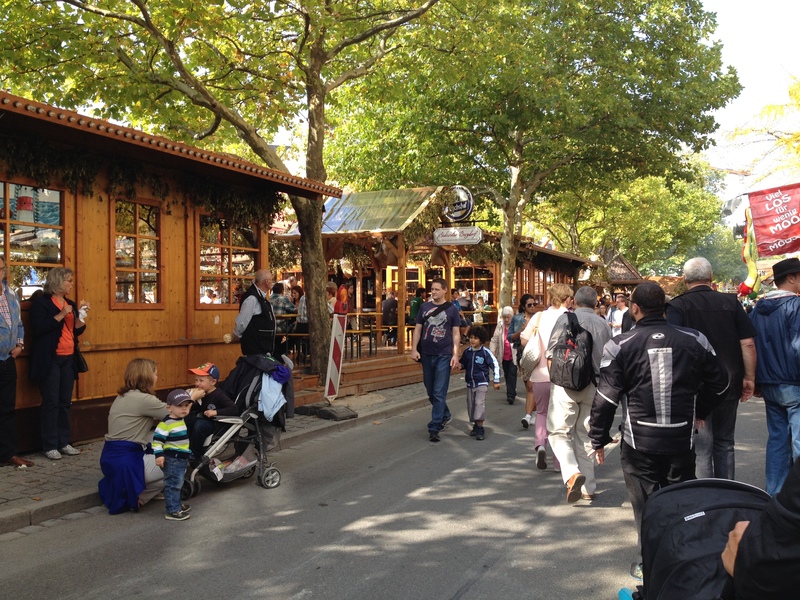 This long-established festival takes place right in the heart of the city and takes over several blocks for more than a week. During that time, the streets are full of food tents and beer gardens, carnival rides, vendors selling everything from leather belts to kitchen tools and an ever-evolving cast of characters worthy of hours of people watching. In short, this was heaven for a State Fair-loving girl like myself. Old TV shows–and their stars–never die. They live on in Germany. Because nothing says excitement and frivolity like remembering episodes of Home Improvement. Also, is he giving her bunny ears? It was also an opportunity to reinforce stereotypes. 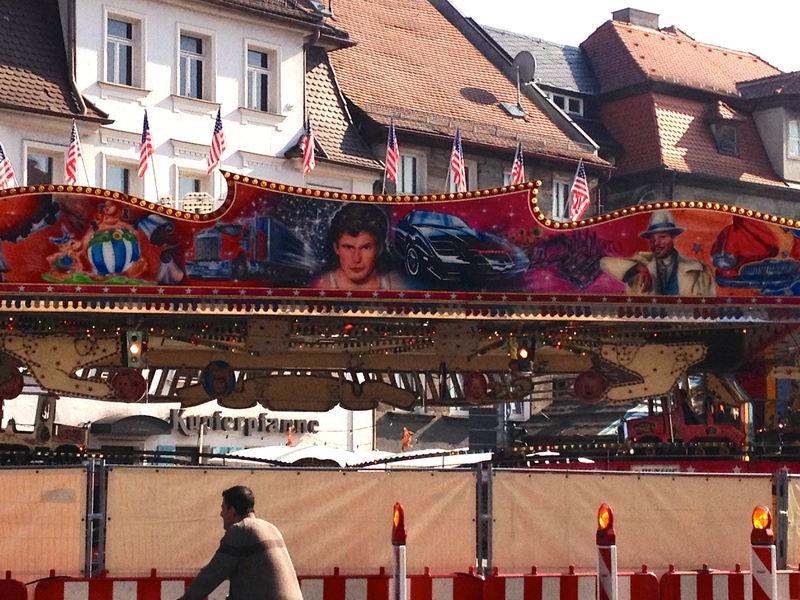 Because there, in all his glory, was David Hasselhoff, larger than life and greeting all from the street. I guess he really *is* big in Germany. 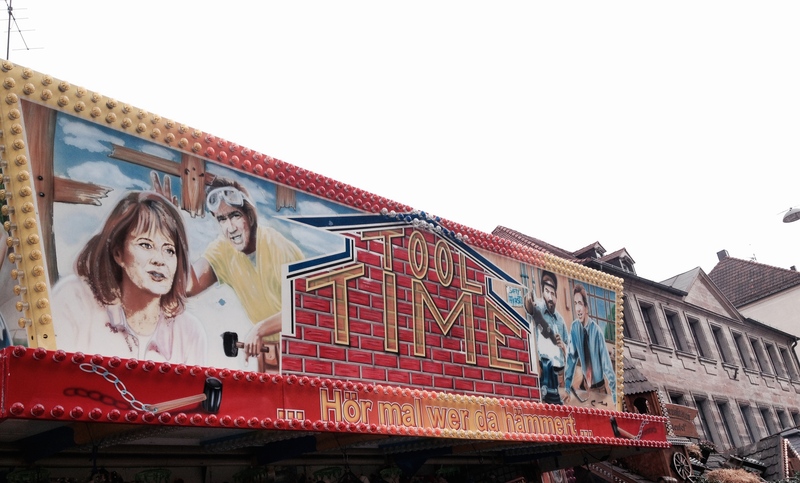 Don’t hassle the Hoff, indeed. The following weekend, we headed back to the festival to watch the parade. Apparently it’s kind of a big deal and is shown on television with (they say) hundreds of thousands of people tuning in. Not knowing what to expect, we arrived very early. We didn’t really know the route, but had a general guess. So we staked out a spot that seemed to have good viewing and waited. And waited. We stood there for quite some time, second-guessing ourselves for choosing a spot that seemed far closer to the end of the route than the beginning. But finally our instincts were rewarded with the perfect place to view the giant balloon release. Furth’s official colors of green and white take to the sky to kick off the parade. 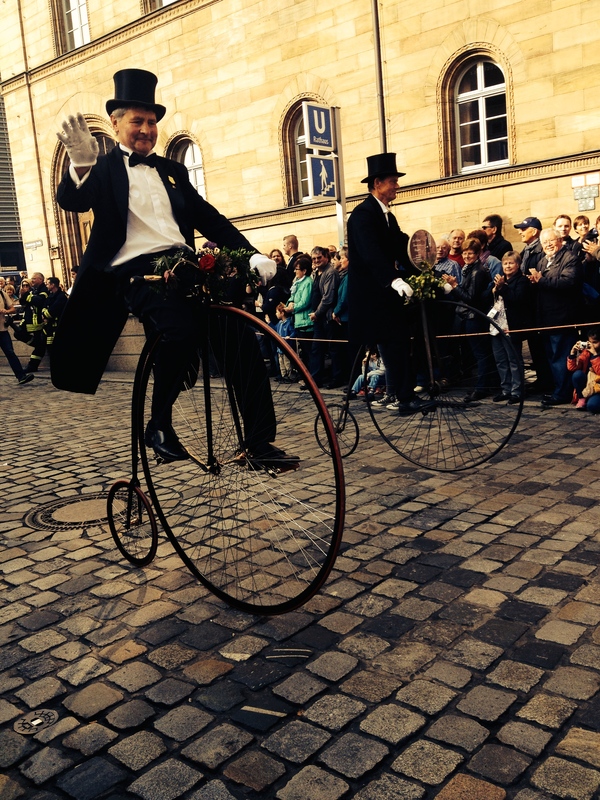 So here’s the most important thing I learned about (hopefully all) German parades. While in the U.S. it is common for the parade walkers to throw candy to the children watching, we got other better things. 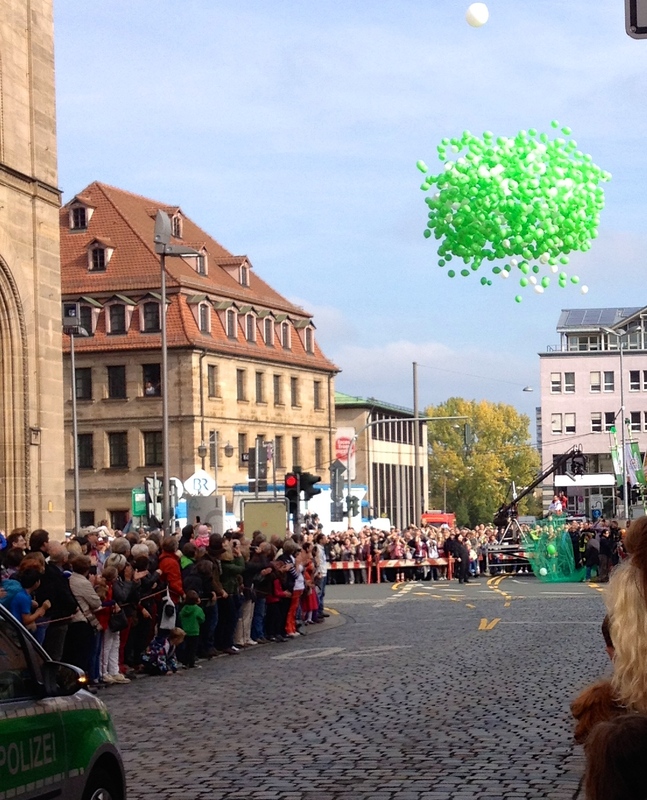 Our outstretched hands were filled with balloons, sausages, beer and soup! It was like Costco on a Saturday morning out there! 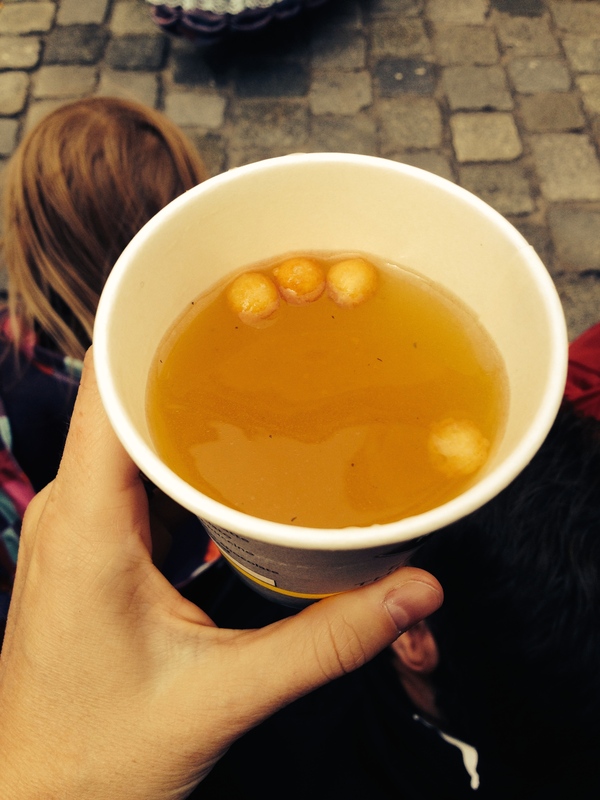 The soup, handed out by one of the parade walkers. It was chickeny with little crunchy croutons floating in it. Delicious. The parade itself is a celebration of agriculture and the harvest and all the area farms and breweries. 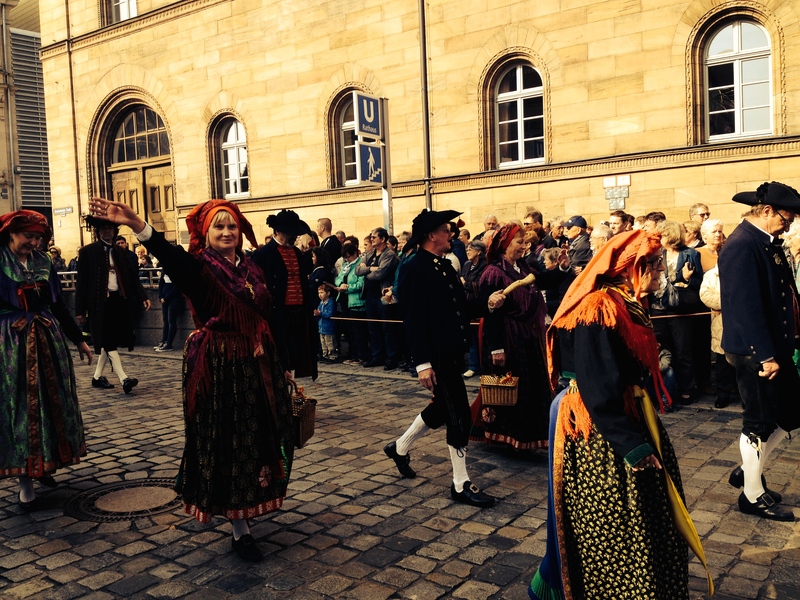 Dozens of clubs in traditional attire represented families/clans/towns in Bavaria. Each one had slightly different–but equally beautiful–variations of dress. Marchers proudly showing their traditional dress. 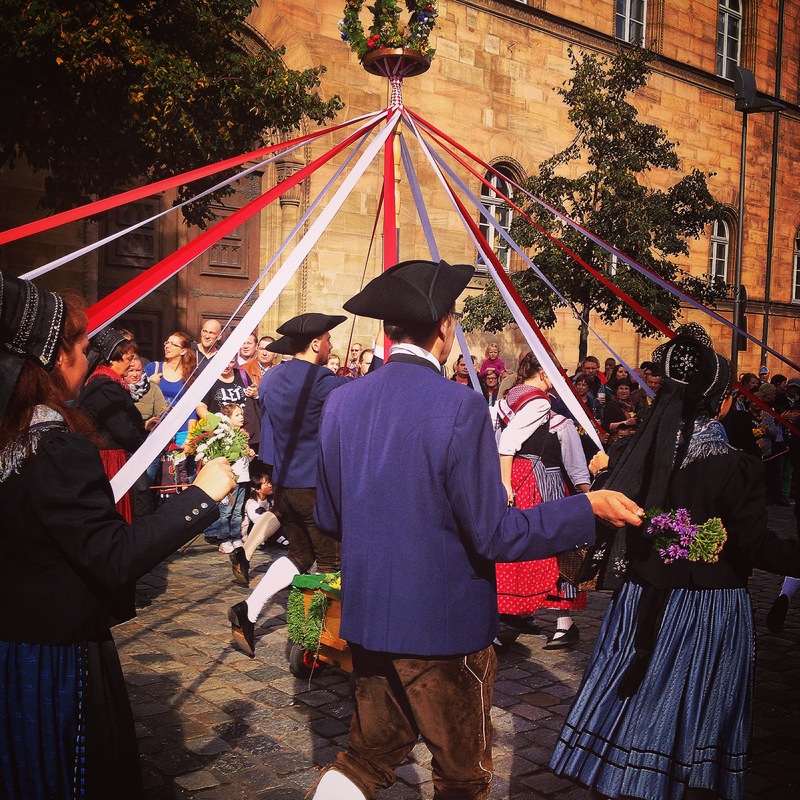 Some even marched with a mobile maypole. The “Floats” consisted of wagons pulled by horses. The wagons were either 1) full of wooden kegs of beer or 2) full of people showing aspects of traditional farm life or 3) full of seasonal vegetables and fruits, artfully arranged. Demonstrating the ways of yore. The entire parade was just so wholesome. It really made me feel like I had stepped back in time a bit. Well, that and David Hasselhoff. That helped too. And really, what parade is complete without an old-timey-bike guy?